Over the spring and summer I been frequently visiting a Ospreys nest. Watching the pair go about their day to day business, while the world around them did the same. Always placing myself safe distance to watch and take pictures. You got to have lot of patience and enjoy your subject to get the right picture. Learning about their habits, in order to be in a better position to tell when one is going to fly to and from the nest. While I was watching the nest, on the other side of the river two couples started to fish, not aware of the nest. After about half hour of trying, they decided to move on. Unlike the Ospreys, they had no luck catching fish. As the couples were headed for their car, I heard a call from the Osprey on the nest. I looked around and saw its mate heading for the nest with a fish in its talons, partially eaten. 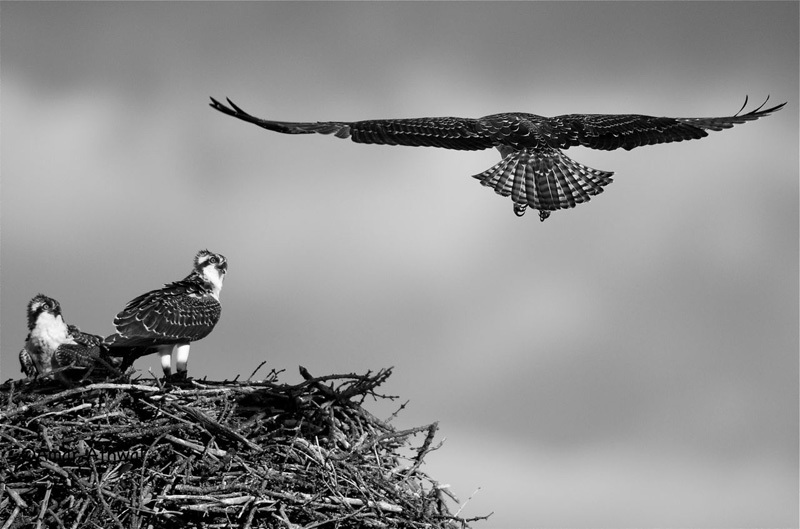 All within a minute, from the time the one Osprey landed with the fish on the nest. It placed the fish on the top of the nest and moved away from it while getting into a low profile. Giving the space for its mate to hop on the fish and fly away to eat what looked like a Rainbow Trout in peace. What team work.